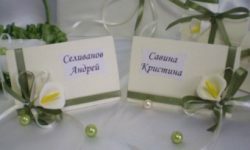 As in recent years there has been a noticeable increase inInterest in Slavic design in the design of the apartment, you can use simple tricks to emphasize the ethnic orientation of the interior. But even in the absence of interest in a certain style, you can make the room much more comfortable by doing mats yourself from old things. 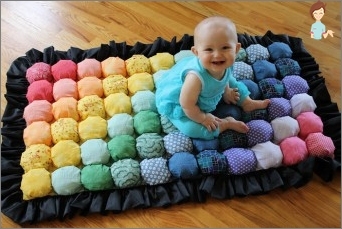 Maybe the rug is simple, but how cute it is! 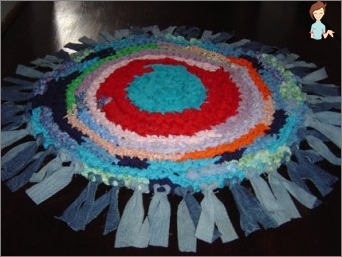 Use of old T-shirts, knitted things,Worn jeans will significantly save on the interior. If there is not enough experience in making objects with your own hands, it is recommended to start with the simplest models. To weave a rug from strips of tissue,Purchase a special canvas. Outwardly it resembles a nylon or plastic net with rather large cells, through which a thick crochet hook will easily pass. In the absence of knitting skills, it is possible to pass strips of tissue through the mesh with your hands. If you need a small mat on the size, the excess mesh is cut off. The edges are processed with strips wider. By the way, if there is a fabric of contrasting colors, it is not difficult to perform an object with a geometric pattern. It is possible to significantly simplify the task if we weave a rug from a rope. In this case, it will be enough to cut into small pieces. 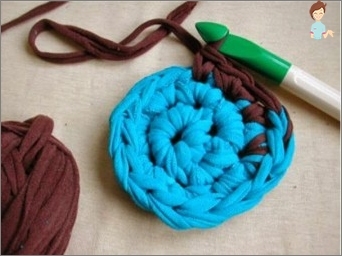 A wonderful option - to paint the ropes in different shades. 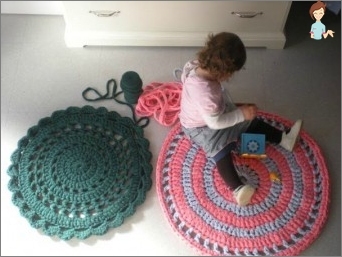 Of course, you can make a traditional matRound form, crocheted, which many in childhood saw in the grandmother's room. But in this product it is difficult to achieve originality. It is much more interesting to bring a little creative into the work, creating a funny mat of balls. The edges of the grid can be, like the previous version, treated with thick strips of old things. By the way, traditional rugs of round form will look much more interesting if you perform them from ropes or strips of cloth braided with pigtails. The set of necessary things to create this model changes slightly. You will need a twine, an adhesive gun and a cut of twine. When the pigtail is finished, its end is tucked inside and fastened with an adhesive gun. Being skilled to weave rugs of the round form, it is possible to diversify work and to make rectangular. 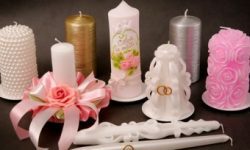 If it is useful for mother to do needlework,Creating a knitted floor mat or a rug from the shreds for comfort, the child also will not interfere with mastering the simplest technique, developing the motor skills of the fingers. That's just for work the kid will need sheets of colored paper. A sheet of paper of the same color is cut with scissorsLine, not bringing them to the edge. It is desirable that they are approximately the same distance from each other. From a sheet of contrasting color, strips are cut, the width of which is equal to the distance between the lines cut on the first sheet. Each strip is weaved into the base, alternately taking out the outer and inner sides. In order for the weave to hold well, you can glue the edges of the strips near the finished rug. Weaving the paper mat becomes funEntertainment, which can grow into a real hobby. 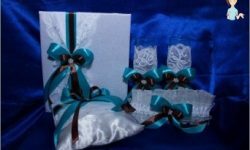 Who knows, perhaps, from a little girl, with a passion for weaving the simplest pattern of colored paper, will eventually become a real skilled needlewoman?